was held at the University of Pennsylvania's Kislak Center. 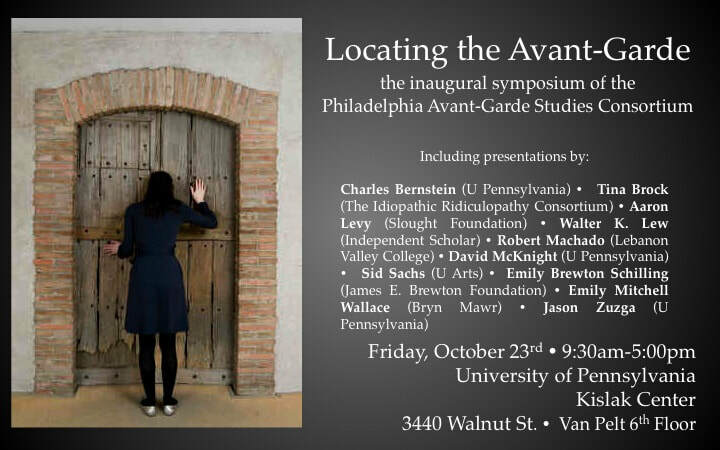 Robert Machado, Lebanon Valley College: "Monochrome 'Vandals': A Female Vernacular Avant-Garde (?) in Late 19th/Early 20th-Century Photography"
Sid Sachs, University of the Arts: "Invisible City: Philadelphia and the Vernacular Avant-Garde"
Walter K. Lew, Independent Scholar: "Why the Line Doesn't Assassinate the Circle: Productive Difficulties in Localizing the Work of Yisang"
Charles Bernstein, University of Pennsylvania: "Too Philosophical for a Poet"
Aaron Levy, Slought: "Second Life"
Tina Brock, The Idiopathic Ridiculopathy Consortium: "Staging Ionesco's World of Dreams"
​Emily Mitchell Wallace, Bryn Mawr College: "'Ten years of beauty & the gods can envy': Ezra Pound and Hilda Doolittle in Philadelphia, 1901-1911"
Emily Brewton Schilling, James E. Brewton Foundation: "Locating and Relocating the Avant-Garde: James E. Brewton's Journeys in 1962 and 1965"